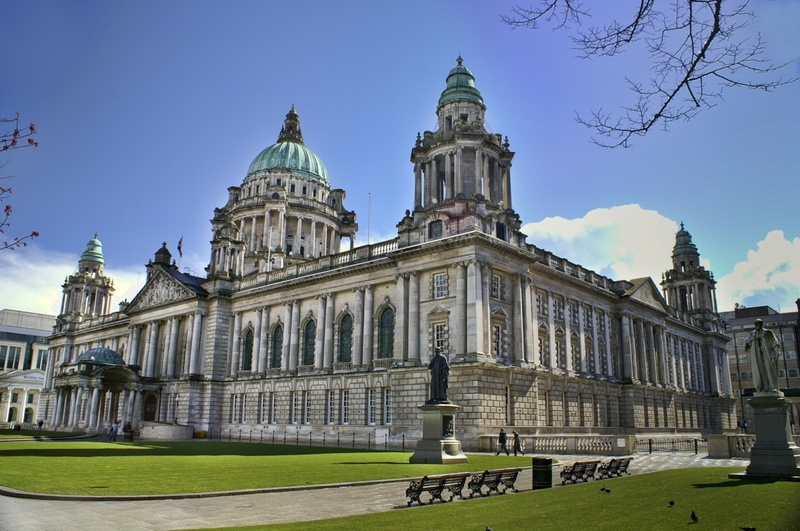 Belfast is the intriguing capital city of Northern Ireland. Famous for many things, Belfast is probably most well known for its linen production and its ship building. The Titanic was built here and there are many historical sites dedicated to this subject. While only officially have a status as a city since 1888, the city has a long and rich history. Belfast is the largest city in Northern Ireland and the second largest city in all of Ireland. When visiting Belfast there are many places that a traveler must visit. The city offers a rich variety of historical places, culture based events, shopping and dinning districts, outdoor adventure and leisure activities. Belfast Castle is a beautiful architectural masterpiece, located in the perfect location to overlook the city. This home, turned public park, was given to the city as a gift in the 1930’s by the late 9th Earl of Shaftesbury. The original castle, built on a different location, was constructed by the Normans in the 1200’s, and later rebuilt in 1611. That castle burned to the ground in the early 1700’s. The new castle was built in the 1800’s on the location that it stands today. There are many events that take place at the castle. Weddings, afternoon tea’s and other special events take place on its grounds. A new children’s playground has been erected on the grounds making it the perfect place to spend an afternoon. The St. Ann Cathedral or Belfast Cathedral is an awe inspiring structure. The cathedral remains open for services and may be visited during the weekdays. The congregation itself can trace its roots back to the early 1600’s. However, this grand building had its first stone laid in 1899 and was officially consecrated for the Church of Ireland in 1904. Queen’s University is a grand building located in the heart of of Belfast. Chartered in 1845, the university is one of the top colleges in the UK. The City Hall is an enormous Baroque Revival building with flowing grounds surrounding it. During the summer months the grounds are used for festival and carnivals as well as a place to picnic and relax. The Botanical Gardens is located near the Queen’s University area and is a popular destination for tourists and locals. Established in the early 1800’2, the gardens occupy 28 acres of beautiful landscape. The Palm House, the gardens beautiful glass greenhouse, contains a 400 year old Xanthorrhoea and a Spear Lily, native to Australia, that took 23 years before it bloomed. Also on the grounds of the Botanical Gardens is the Ulster Museum. The Ulster Museum contains a large collection of art, natural history pieces and historically significant displays. Located around the city are many murals. These Irish murals are often bright in color and depict the plight of the Irish people. Fabulous to observe and enjoy, visitors must take the time to view these wonderful paintings. The Grand Opera House continues today to offer a variety of performances. Established in 1895, the Opera House only seats 1000 people, but has continued to provide entertainment for over 100 years. Waterfront Hall is a large venue entertainment complex that opened in 2001. Concerts, plays, operas and other cultural events take place here year round. The Odyssey Arena, located on Queen’s Island in Belfast, is the largest sports complex in the city. All major sporting events are held here as well as large music concerts. Belvoir Zoo sits on 55 acres of well kept land, hosting about 1200 animals from 140 different species. The Zoo is home to many endangered animals, some who have not been seen in the wild for a very long time. It is a wonderful daytrip for the family and an experience you will not forget. The waterfront offers many sites to see and restaurants to select from. The River Lagan is a 40 mile long river that flows into Belfast Lough, an inlet to the Irish Sea. The waterfront area has recently been renovated and revitalized. Located near the River Lagan is St. George’s Market. This market is the last of the covered Victorian marketplaces in Northern Ireland. Still used as a marketplace today, St. George’s Market also holds many small concerts during the year. Belfast City Centre is the central point of the Belfast business district. In recent years however, many new entertainment venues and residential areas have been built in the City Centre area. Find information about selected Hotels, apartments and rooms in Belfast to choose the perfect place for your accommodation.